Millions of students enrolled in online courses can build credibility around their learning and showcase it to the world on Accredible. Accredible, an Imagine K12 startup that provides users with the ability to make learning transparent and share it with the world, recently announced that it has built-in support for 850 massive online open courses (MOOCs) from most major online course providers such as Coursera, edX, Future Learn, iTunes U, Khan Academy, OpenLearning, Saylor, Udacity, and Udemy, just to name a few. Accredible enables users to create knowledge profiles and create individual “slates” for different knowledge, skills, or courses. They can then fill the blank slates with evidence of their learning like lecture notes, homework assignments, and even videos of them completing exams. With the new MOOC compatibility, students can create slates from a menu listing the full course lists of various MOOC providers. Whether students are motivated by curiosity, passion, or the need to advance in the workforce, Accredible provides an ideal platform for them to track and lend credibility to their course work. Beyond the realm of MOOCs, Accredible empowers all learners – from traditional schools to self-teaching – to take pride in the educational journeys and showcase their learning publicly. The increase in online education of 17% from 2012 is prompting the emergence of an entire ecosystem of visionary companies that want to facilitate the teaching and learning of the masses, but they all hinge on MOOC enrollment and the completion of courses. The public nature of Accredible profiles and the transparency around the learning prompt people to take their coursework seriously and to feel a genuine sense of accomplishment as they add pieces of evidence to their slates to document their learning journeys. Accredible’s support of major existing MOOCs is an important contribution to keeping students motivated and invested in completing coursework, a critical factor to consider in evaluating the success of and future creation of MOOCs. Alan Heppenstall and Danny King co-founded Accredible after realizing that students did not have a way to showcase their skills in a traditional college or job application. The Accredible mission is to empower people to take pride in tracking their educational journeys and to make all types of self-education as credible as a college degree. In the spring of 2013, they relocated to Silicon Valley to join the premiere edutech incubator Imagine K12. To learn more about Accredible, visit Accredible.com, “Like” them on Facebook: facebook.com/accredible or follow them on Twitter at @BeAccredible. For more information and interviews, contact Danny King directly at danny(at)accredible(dot)com. 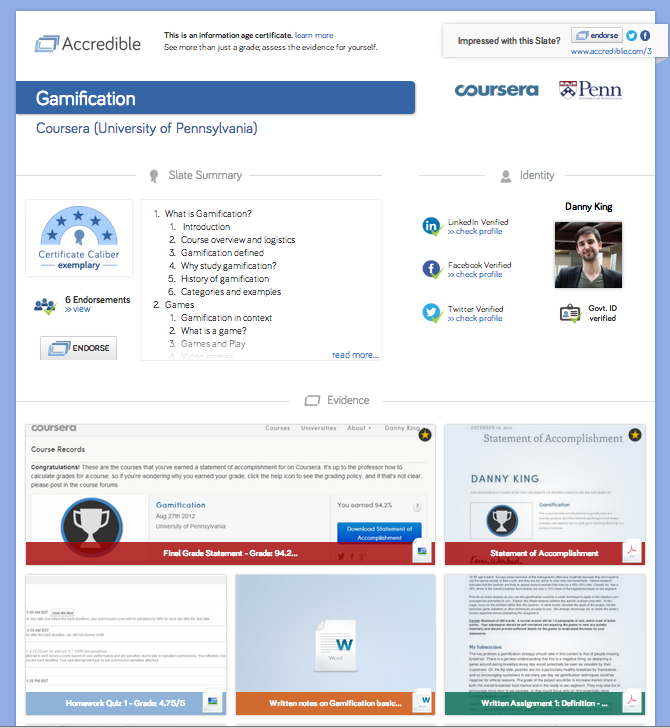 Co-Founder Danny King's Accredible Slate for a Coursera Gamification courseDanny KIng's Accredible Slate features a variety of evidence for his learning: Coursera certificate, homework assignments, and notes.